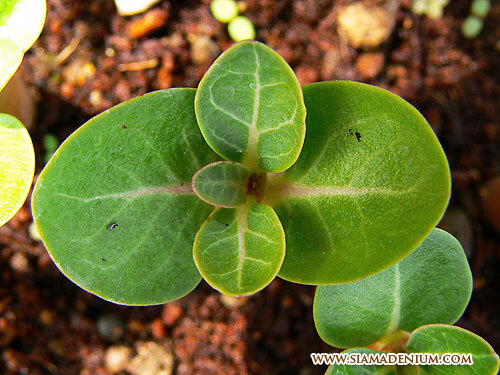 seedlings such as symmetric branches, spread root, antique caudex skin, etc. 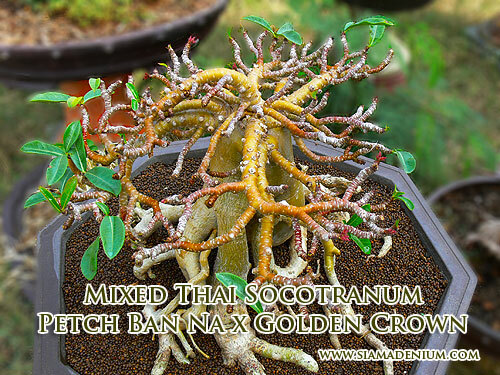 New hybrid from Thai Socotranum "Golden Crown" x ""Petch Ban Na"
bonsai technique to make them grow like Bonsai. 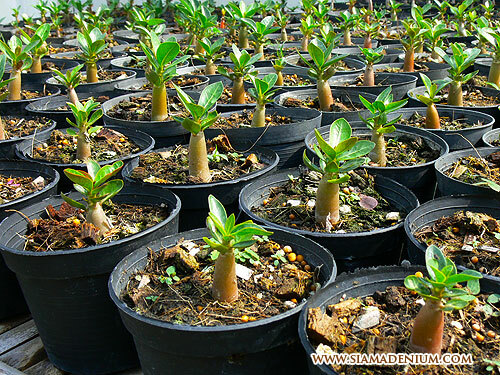 What Adenium hybrids can use for form playing? 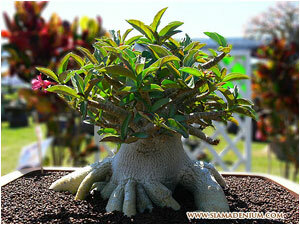 In here, Thailand, we love to use Adenium : Thai Socotranum or mixed hybrid between Thai Socotranum and Arabicum. The most popular of Thai Socotranum is “Golden Crown” and also very expensive here. You can know about Thai Socotranum and Arabicum by clicking the “hybrids” icon on green menu above. 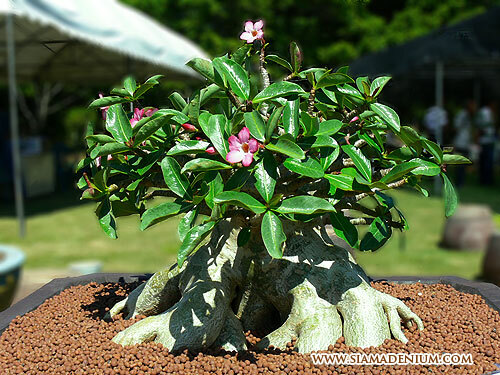 I have spent 4 years to learn all of Adenium hybrids especially with Thai Socotranum and Arabicum and found that only Thai Socotranum and mixed hybrids from Thai Soco x Arabicum can better grow in Bonsai form. The natures of their growing are lengthy branches, non-symmetric branches and big trunk. This is very old style or obsolete form and here we don’t play with this form anymore so I have spent my time to study and develop them until they came up with new style with bonsai form. How do I do that? Here below are techniques I would like to share. This would help you save your time for better growing. The most important thing that I always emphasize about growing with better form is “Hybrid Knowledge”. 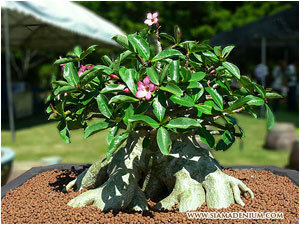 There are 3 main things to notice with good or bonsai form; Spread Roots, Symmetric Branches, and chubby caudex. Actually there are some more things; Leaves Styles, Caudex Skin, Branches Antinodes, Caudex Color, etc but you just follow 3 main things I mentioned above should be enough. The 1st step: Baby Seedlings (aged 1-1.5 months) You need to work hard on baby seedlings, 1-1.5 months, since they grow up from the media. The media I used for baby seedlings (growing them in basket) is coconut powder mixed with cow manure and fermented soil in ratio 2:1:1. After 1.5 months, you need to repot them in 4 inches pot. After finish repotting, you need to water them with B1 root hormone mixed with Chitosan. This would help roots are get used to new media faster and make more roots especially with fibrous roots. The media I use for this time is soil fermented for 3 months, fish organic fertilizer, cow manure, and pound bone. 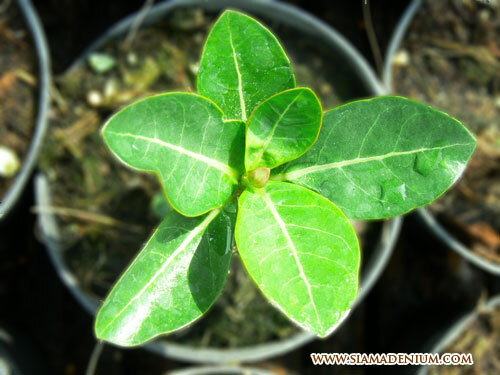 You can easily notice why I mostly use the organic fertilizer and avoid chemical fertilizer because organic fertilizer can help seedlings will grow healthier, resist any diseases by themselves and help media loose perfect with Adenium growing. 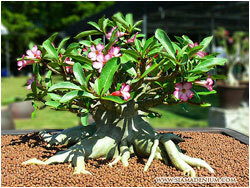 Chemical fertilizer will make media tight and then it will retain water made Adenium root not grow and rotten. 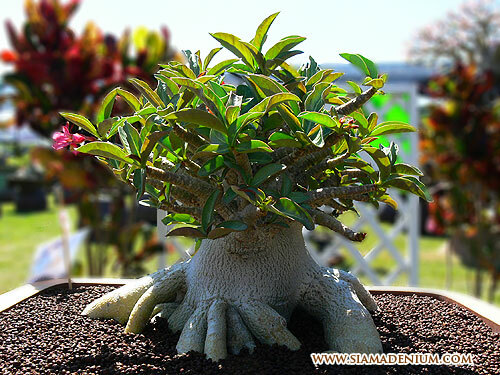 Fish fertilizer can help Adenium produces more branches and stronger caudex. 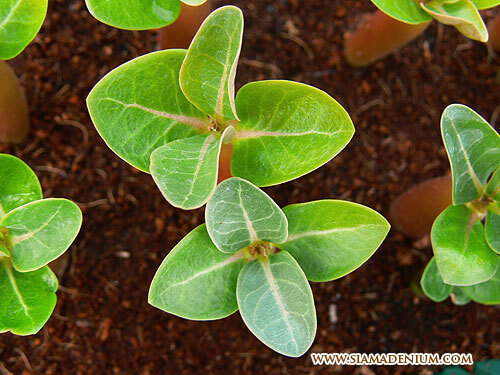 The 2nd step : Seedlings (aged 2-6 months) This step is also important because seedling start showing the form especially with branches and roots. The media and fertilizer use is the same with the 1st step. You need to repot them again in 6 inches pot. You also need to organize their roots for this time. 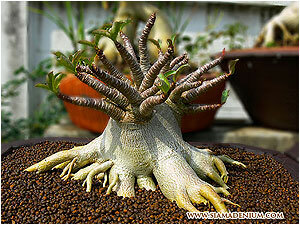 Try to make roots spread out of caudex, this would help roots feel better and absorb more water and fertilizer. You can notice them that they grow faster and better form. 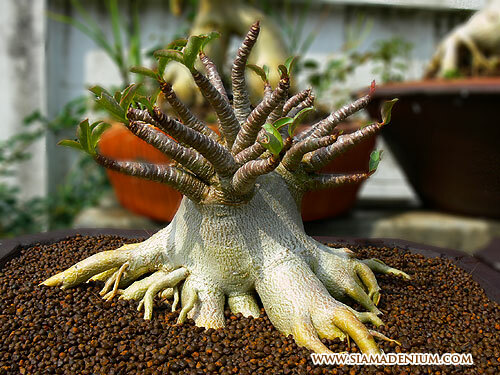 As I said before, more roots and branches will help chubby or shorten caudex and symmetric branches. Some growers like speed up them with high dose fertilizer because they want to make bigger size in short term. It’s not good because it will be like fat man but not strong and healthy. 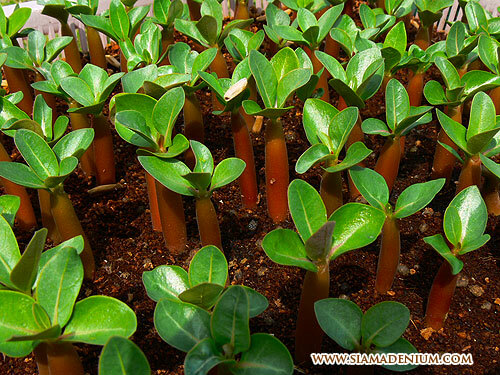 This also makes caudex skin become fresh green, not antique skin, so this is not matched with in bonsai term. 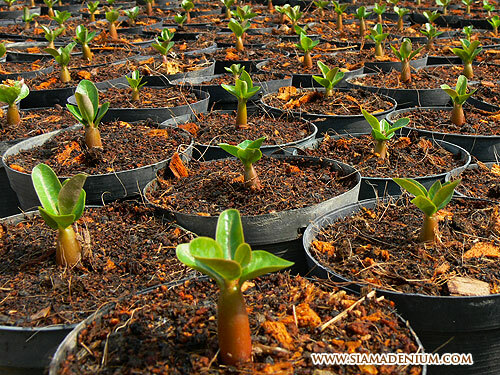 The 3rd step : Seedlings (aged 6-9 months) Keep growing them like 2 steps above. No need to cut the leaves to stop longer branches. This is old technique for Arabicum. 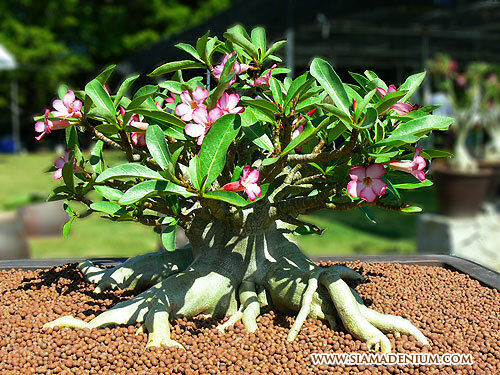 It’s not necessary to do that with Adenium: Thai Socotranum and mixed hybrid (Thai Soco x Arabicum) because they will set up the branches themselves or I can say branches will grow beautifully by their natures. The only thing you need to is to organize the roots and you should do it monthly. The Final step : Seedlings (aged 9 months up) Keep pruning the branches and organizing their roots. You should know the bonsai technique about how to prune or trim branches. You should spray them with Chitosan mixed with B1 root hormone every week to make them better absorbing nutrient and fertilizer in media. 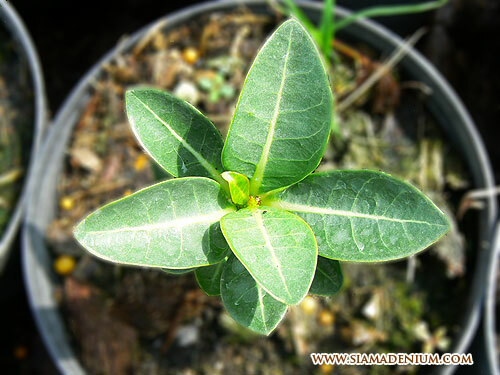 I think all of these brief steps above can help you grow Adeniums in better form and have fun. 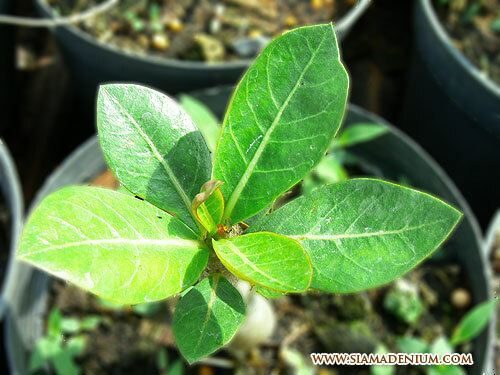 Leaves are also one of attractive points with Adenium forms but this is also ignored by growers and players. Some forms are nice but not matched with their leaves. 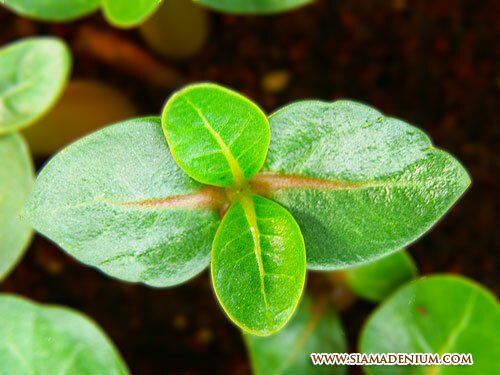 From photo belows show many leaf styles from new crossing between Thai Socotranum and Arabicum. I think that’s all for today, I hope you will have fun with new growing technique or ideas I shared above. Please feel free to ask me if you have any questions or comments. Have a good day.